Though there are ambiguities and nuances explained at Snopes, the gist of this list of suffering is real. The Founders of America who signed the Declaration of Independence painted a bull’s-eye on their chest. They did this to secure our freedoms as a Christian nation. With a new election upon us it is imperative we move quickly to save our liberties and value of human life. Are we willing to suffer as these men did for liberty, life, the freedom to worship God, the sanctity of life and so much more? Have you ever wondered what happened to those men who signed the Declaration of Independence? Five signers were captured by the British as traitors, and tortured before they died. Twelve had their homes ransacked and burned. Two l ost their sons in the Revolutionary Army, another had two sons captured. Nine of the 56 fought and died from wounds or the hardships of the Revolutionary War. What kind of men were they? Twenty-four were lawyers and jurists. Eleven were merchants, nine were farmers and large plantation owners, men of means, well educated. But they signed the Declaration of Independence knowing full well that the penalty would be death if they were captured. Vandals or soldiers or both, looted the properties of Ellery, Clymer, Hall, Walton, Gwinnett, Heyward, Ruttledge, and Middleton. At the Battle of Yorktown, Thomas Nelson Jr., noted that the British General Cornwallis, had taken over the Nelson home for his headquarters. The owner quietly urged General George Washington to open fire, which was done. The home was destroyed, and Nelson died bankrupt. John Hart was driven from his wife’s bedside as she was dying. Their 13 children fled for their lives. His fields and his grist mill were laid waste. For more than a year he lived in forests and caves, returning home after the war to find his wife dead, his children vanished. A few weeks later he died from exhaustion and a broken heart. They gave us an independent America. Can we keep it? Please read this additional information from Prof. Brooke. On at least one website, Gary Hildreth, of Erie PA, is listed as the author of “The Price they Paid”. Here is what I have been able to find based on a few hours in my university’s limited library and the book, “The Signers of the Declaration of Independence”, by Robert G. Ferris and Richard E. Morris of the U.S. National Park Service (Arlington, VA: Interpretive Publications, Inc., 1982). NO SIGNER WAS KILLED OUTRIGHT BY THE BRITISH. Lets examine some of the statements more closely. “Five signers were captured by the British as traitors and tortured before they died.” This passage, to me at least, implies that the signer were captured under charges of treason and died under torture. Five signers were indeed captured by the British, but not necessarily as traitors. Richard Stockton (NJ) was the only one who was probably captured and imprisoned just for having signed the Declaration of Independence. Ferris and Morris also note that he was not well treated in captivity and was in ill health when released. He never completely recovered. He did not die in prison, however. George Walton (GA) commanded militia at the Battle of Savannah in December, 1778. He was wounded and captured at that time. Thus he would have been considered a prisoner of war, not a traitor. He was released within a year, which implies that his signature on the Declaration was not as important a factor in his captivity as his active military role in defending Savannah (prisoners of war were exchanged on a regular basis, a traitor would have been hanged). Walton lived to serve as Governor of Georgia and U.S. Senator, dying in 1804. Thomas Heyward, Jr., Arthur Middleton, and Edward Rutledge (SC) were all captured at the Siege of Charleston in 1780. They were held at St. Augustine (then under British control) until September 1781 with other Continentals. Two months after his release, Arthur Middleton returned to Philadelphia to resume his seat in the Continental Congress. Despite the destruction of his estate, he was able to rebuild it and live there until his death in 1787. Edward Rutledge sat in the State Legislature from 1782 to 1798. He was elected Governor of South Carolina but died before completing his term…in 1800. Ferris and Morris report that he died a very wealthy man. Thomas Heyward, Jr. served as a circuit court judge from 1782 to 1787. He served as a state legislator at the same time. Heyward lived well into the 19th century, dying in 1809. I checked about 8 general histories of the American War for Independence and one or two specialized works on the southern campaigns. None of them even mentioned that signers had been captured at Charleston or Savannah, let alone mention that any were singled out for harsh treatment. This seems to indicate that their capture was part of the “normal” course of war, not a special effort. I found only one reference to the treatment of prisoners from the southern campaigns, in Lynn Montross, “Rag, Tag, and Bobtail”. This work states that the continental troops from the siege of Charleston were held on prison ships. Conditions were poor and about a third of the prisoners died. If one takes the word “torture” to mean pain and suffering, then I suppose these men were tortured. To my mind, however, torture implies an intentional infliction on pain, usually either to extract information or to punish. I have found no evidence of the latter. Here is an interesting passage from Larry G. Bowman, North Texas St. Univ., on Prisoners of war: “Prisoners of war did suffer during the American Revolution. No other conclusion can be reached regarding the welfare of captives on both sides. Men were beaten, deprived of food by corrupt officials, denied bedding and clothing, and harassed in other ways but, fortunately, such incidents of outright cruelty were not routine events. Actually, most of the suffering of the men came from the more subtle torment usually brought on by neglect on the part of their captors. Neither the American nor the British authorities sought to induce suffering among the men in their prisons, yet men did want for basic services. The shortcomings on both sides of the conflict in providing for the captives was evident, but the motivations behind the failures were not evil or vindictive in their origination. Neither party entered a program of deliberately tormenting prisoners.” Encyclopedia of the American Revolution, v. II, p. 1334 (New York: Garland Publishing, 1993). The British undoubtedly put a price on the heads of rebel political officials (not just signers) and the signers no doubt feared that the British would make good on the threat. The reality is, however, that none were executed for their treason. Let’s look at another assertion….Nine of the fifty-six fought and died from wounds or the hardship of the Revolutionary War. 1. Josiah Bartlett (NH) as surgeon with Gen. John Stark’s troops at Bennington. Bartlett declined national offices (citing fatigue or ill health) but remained active in state affairs and died in 1794. 2. Button Gwinnett (GA) in a failed campaign to take St. Augustine. Killed in a duel precipitated partly by an argument over military strategy in 1777. 2a. George Clymer served with the Pennsylvania militia. Died in 1813. 3. Thomas Heyward, Jr. (SC). Wounded in 1779 near Port Royal Island, SC. Recovered and served in the siege of Charleston. Died 1809. 4. Thomas Lynch, Jr. (SC) Military career cut short by illness in 1775. 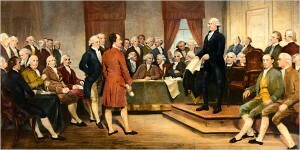 He then was elected to the Continental Congress. In an attempt to restore his health, he left for the West Indies, but was shipwrecked and killed in 1779. 5. Arthur Middleton (SC) Captured at the siege of Charleston. See above. 6. Lewis Morris (NY) Brigadier General of Westchester Co. troops during the NY invasion. After the war, he served in state government and was active in public affairs. Died 1798. 7. Thomas Nelson, Jr. (VA) commanded the Virginia militia. Served in several campaigns in Virginia, including Yorktown. Nelson’s retirement from public life was financially motivated. He died in 1789. 8. William Paca (MD) Served in the Maryland militia. After the war, he was active in MD. affairs and served as a Federal district judge after the Constitution was ratified. Died in 1799. 9. Caesar Rodney (DE). Brigadier General of militia. Active in campaigns against Loyalists in Delaware. Despite having advanced skin cancer, Rodney served as president of Delaware, and speaker of the state senate until his death in 1783. 10. Benjamin Rush (PA). Appointed surgeon general of the Middle Department of the Continental Army. Resigned after 8 months in a dispute over charges he made that the medical corps was not run properly. Extremely active in public affairs, both medical and governmental, Rush died in 1813. 11. Edward Rutledge (SC) Served at the battle of Port Royal Island (1779). Captured at the siege of Charleston. See above. 12. James Smith (PA) Brigadier General of militia. Practiced law until he retired at age 82 in 1801. He died in 1806. 13. George Walton (GA) Colonel of militia. Wounded at the Battle of Savannah, 1778. Died in 1804. 14. William Whipple (NH). Brigadier General of militia. Saw quite a bit of active service, including the Saratoga and Newport campaigns. Died, aged 55, in 1785. 15. William Williams (CT). Colonel of militia to 1776. Mostly active in state affairs, he died in 1811. 16. Oliver Wolcott (CT). Rose to Major General of militia. Wolcott served in the Saratoga campaign and the defense of Ct. against loyalist raids from NY. Lived to attend the Constitutional Convention and to serve as Governor of Ct. Died 1797. Some, like John Hart or Thomas Nelson, died of fatigue or exhaustion brought on by travel and active service. In that sense, the war may indeed have shortened their lives. Then again, how can we know in an age where illness was so commonplace. By the way, would we accept “fatigue” as a cause of death today? Or would we find some more precise explanation. In any case, I don’t know if I would list this cause of death in the same sentence as a reference to battle service. Now….Let’s look at some of the personal stories told….Carter Braxton of Virginia, wealthy planter and trader, saw his ships swept from the sea by the British navy. He sold his home and properties to pay his debts, and died in rags. Ferris and Morris tell a similar story, but watch the twist: “The War for Independence brought financial hardships to Braxton. At its beginning, he had invested heavily in shipping, but the British captured most of his vessels and ravaged some of his plantations and extensive landholdings. COMMERCIAL SETBACKS IN LATER YEARS RUINED HIM.” (p. 42). If Braxton sold his home, he did not sell all of them. This entry also notes that Braxton was able to retain his family seat at Chericoke, and died in his Richmond townhouse. No doubt Braxton’s fortunes were changed by the war, but can we say, truthfully, that his death in poverty was entirely due to the sacrifices of war??? Thomas McKeam was so hounded by the British that he was forced to move his family almost constantly. He served in Congress without pay, and his family was kept in hiding. His possessions were taken from him, and poverty was his reward. So far, this is correct. But Ferris and Morris state that McKean was able to rebuild his fortune” “McKean lived out his live quietly in Philadelphia. He died in 1817 at the age of 83, survived by his second wife and four of the 11 children from his marriages. He was buried in Laurel Hill Cemetery. HIS SUBSTANTIAL ESTATE CONSISTED OF STOCKS, BONDS, AND HUGE LAND TRACTS IN PENNSYLVANIA (p. 102). British soldiers looted the properties of Ellery, Clymer, Hall, Walton, Gwinnett, Heyward, Ruttledge and Middleton. Also William Floyd (NY), John Hart (NC), William Hooper (NC), Philip Livingston (NY), Lewis Morris (NY). Oddly, enough, however, the British had the opportunity to loot the homes of several very prominent signers and did not do so. Although the British evacuated Boston before the signing, why didn’t the British vandalize the homes of well-known rebels such as Sam Adams and John Hancock during their occupation of Boston? The British occupied Philadelphia through the winter of 1777, yet the homes of Benjamin Franklin (who surely must have been public enemy #1), James Wilson, Benjamin Rush, Robert Morris. James Wilson’s home was attacked by Americans, including militiamen, during food shortages in 1779 (does it count if the suffering was caused by your own side?). Thomas Jefferson was almost captured at Monticello. Why didn’t the British burn the estate? At the battle of Yorktown, Thomas Nelson, Jr. noted that the British General Cornwallis had taken over the Nelson home for his headquarters. The owner quietly urged General George Washington to open fire, which was done. The home was destroyed, and Nelson died bankrupt. Ferris and Morris also repeat this story, although they qualify it as “family legend”. Nelson was unable to rebuild his fortunes after the war and did indeed die in poverty. Francis Lewis had his home and properties destroyed. The British jailed his wife, and soon after she died. This is true. Although Lewis lived until 1802 (and was 89 when he died), he essentially retired from public life after his wife’s death. John Hart was driven from his wife’s bedside as she was dying. Their 13 children fled for their lives. His fields and his grist mill were laid waste. For more than a year he lived in forests and caves, returning home after the war to find his wife dead, his children vanished. A few weeks later he died from exhaustion and a broken heart. The story is essentially true, but Hart survived two years after his return from exile, not a few weeks. Morris and Livingston suffered similar fates Philip Livingston, a member of the extremely influential NY Livingston family, had several properties in New York and Brooklyn that were occupied by the British. He sold other properties to support the war effort before fleeing the British occupation of NY. He died, at the age of 62, in 1778. There were two signers of the Declaration surnamed Morris. LEWIS Morris of New York, had to flee his home, Morrisania, which was damaged in the British occupation. Ferris and Morris note that he was able to rebuild Morrisania. ROBERT Morris, of Pennsylvania may be even more intriguing. Generally recognized for his fundraising efforts during the war, he was later accused (though vindicated) by Thomas Paine of profiteering. As Superintendent of Finance (1781-1784) he was responsible for keeping the young country afloat financially. In 1789, he declined to serve as Secretary of the Treasury (Alexander Hamilton got the job), but served instead as a Senator from PA. Morris’ own financial dealings were not as successful. He speculated on western lands on credit, lived extremely well, and embarked on an ambitious home building project. All of this led to personal bankruptcy and time in debtor’s prison in 1798. His wife was granted a pension that sustained the family. Robert Morris died in 1806. So there you have it. A grain of truth in everything, but some broad wording that makes for a good story but an inaccurate portrayal of our founders.